I have more wedding DIY's coming for you! 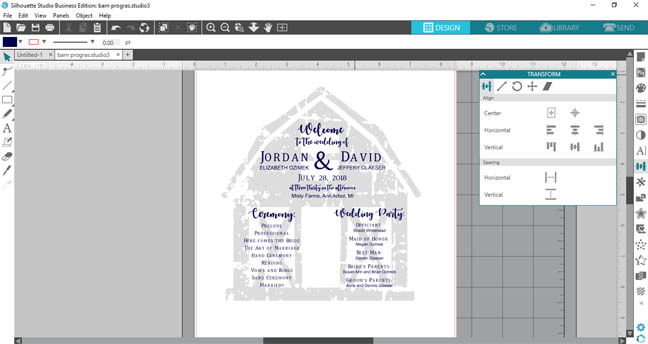 My brother and future sister-in-law tasked me with making the programs for their big day which is taking place on a farm inside a rustic barn. 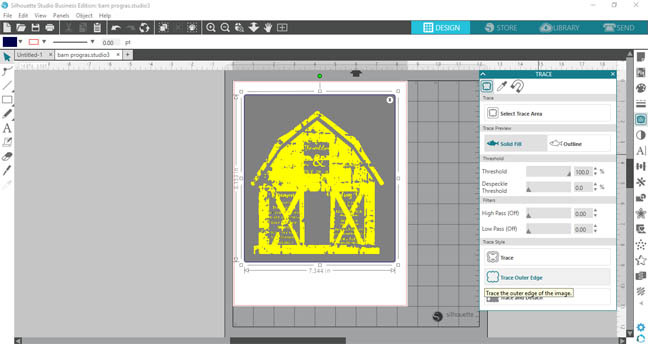 She wanted the barn to be part of the program design and guess what?! 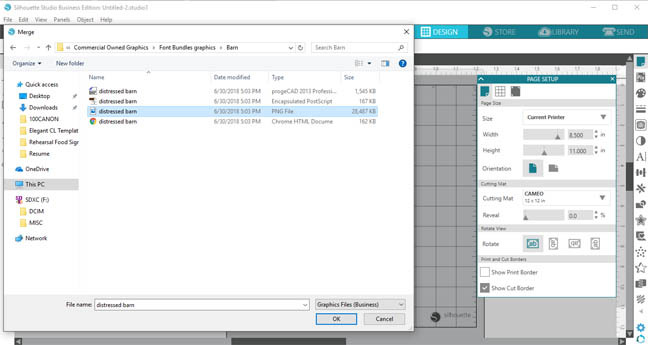 design bundles sells the perfect file already!! I love being able to search for various designs and always finding them. 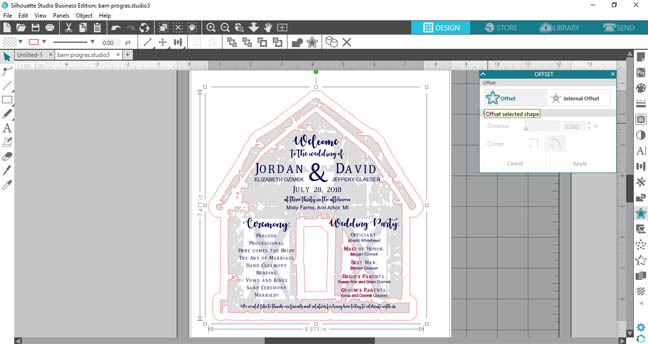 Start by opening the graphics file in Silhouette Studio. You'll need the SVG version which is the bottom file. I don't want the silo portion with the barn. In order to delete it, you'll need to release the compound path. Don't panic when the distressing details vanish! 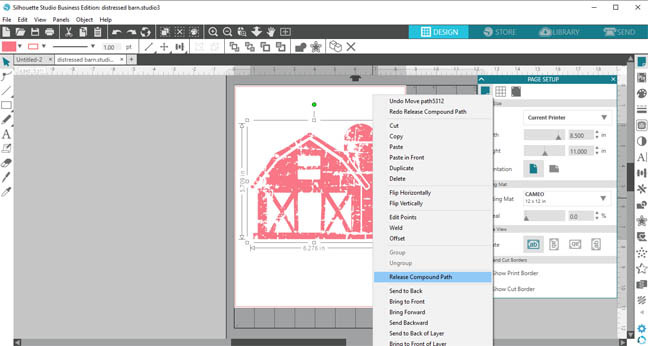 Just carefully delete any silo portions and then select the barn once you're done and make it a compound path again. See I told you it would be ok! Red is not one of their wedding colors so that's easily changed. I went with a light gray so the writing on top would be easy to read. Start adding the text. I'm using Autumn in November as the script and Crolinesy Daggaes Serif with some good old standby Arial as the smaller font as needed. 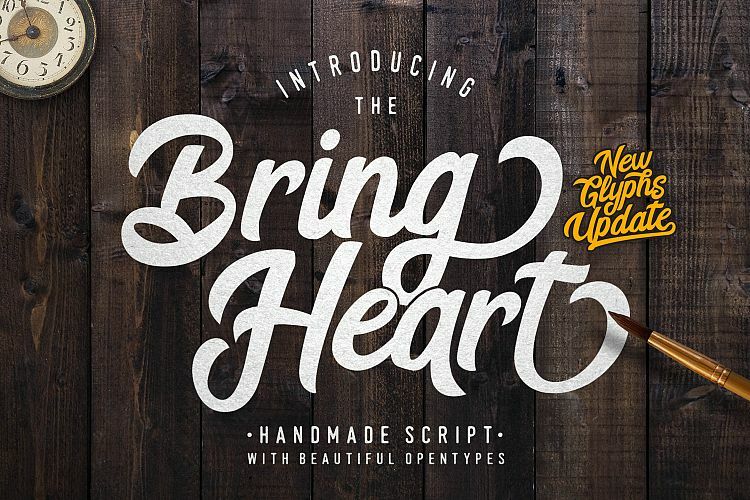 It's easier to work on your text with the barn file moved off to the side. 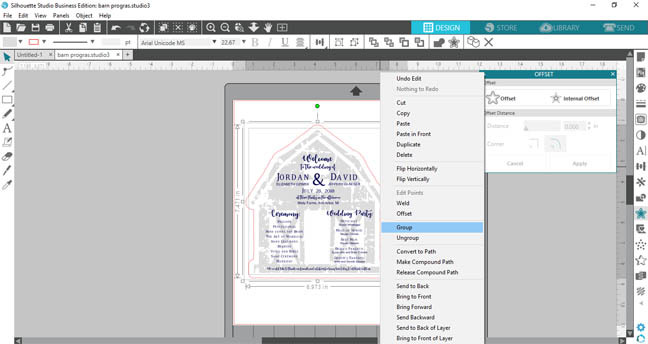 As you complete text groupings you can easily center them using the align tool in the transform panel. I would slide the barn back to check sizing as needed and then back to the side. 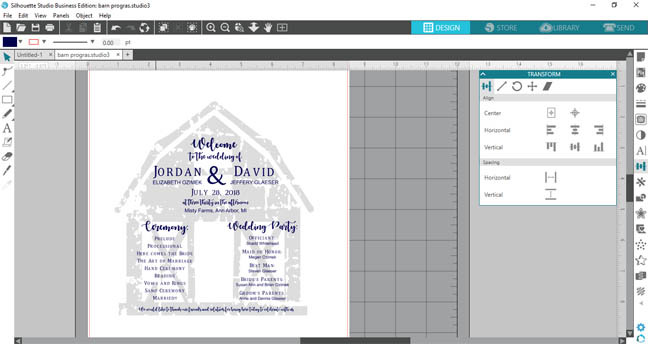 Next, add the color to the text, I went with a navy blue since that's their main wedding color. 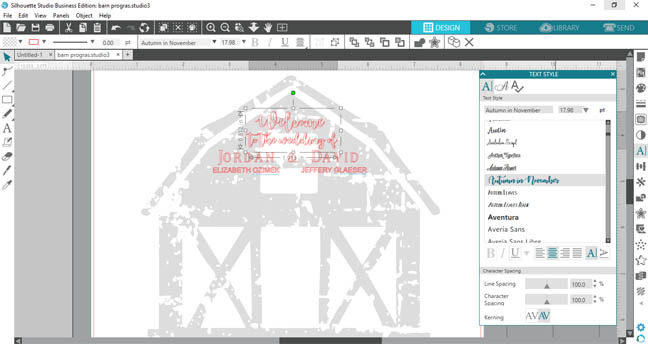 I tried to align the text groupings with the design elements within the barn. Lastly, I added a simple thank you message along the bottom to the guests. Group it all together so you don't accidentally undo all of your hard work! I only want to cut out the very outside edge AND I want some white space around it too. First, trace the image and select trace outer edge. As you can see it traced more than just the main outer portions because of the distressing. Next, go to the offset tool and offset the edge by 1/4". 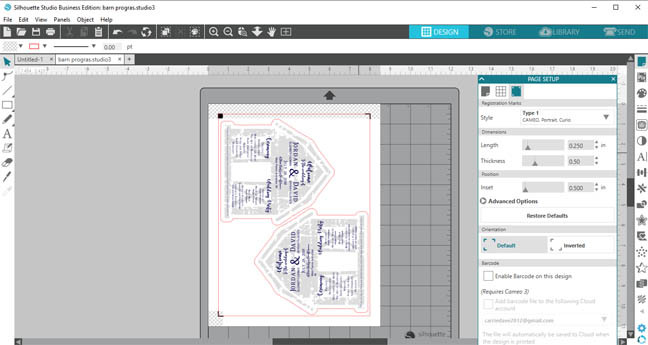 You can delete the original traced portion leaving the offset lines only. It still is trying to cut out the center of the barn. To fix this simply release the compound path and delete the center cut line. Now group everything back together. 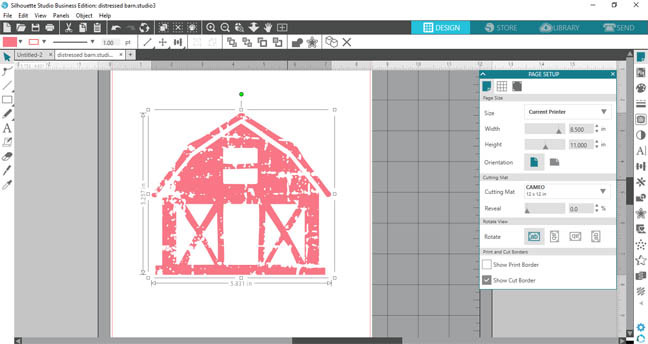 A way to make sure the machine cuts the barn shape out perfectly after you've printed it is to turn on the registration marks. I also shrunk the barn image down slightly so I could fit 2 on one sheet of paper. 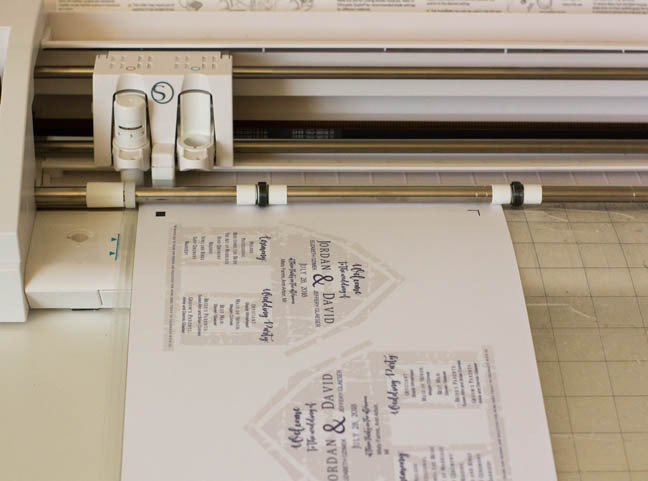 Print one out as a test and load it onto your cutting mat and into the machine. Make sure your cut settings are set to only cut the edge of the barn. You can see the dark red lines showing where it will cut. 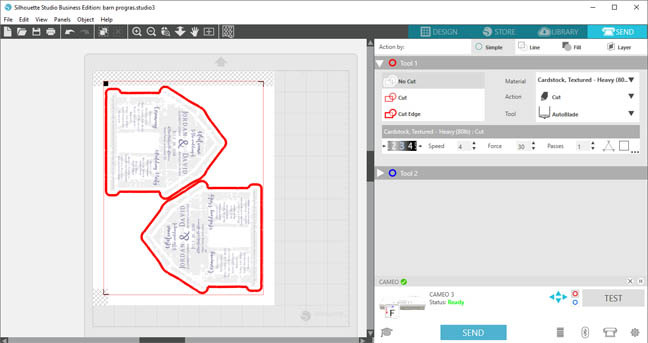 Also, change the material settings for the paper you're using and send it to be cut. As a fan for the guests to cool themselves with since it's outside in July. 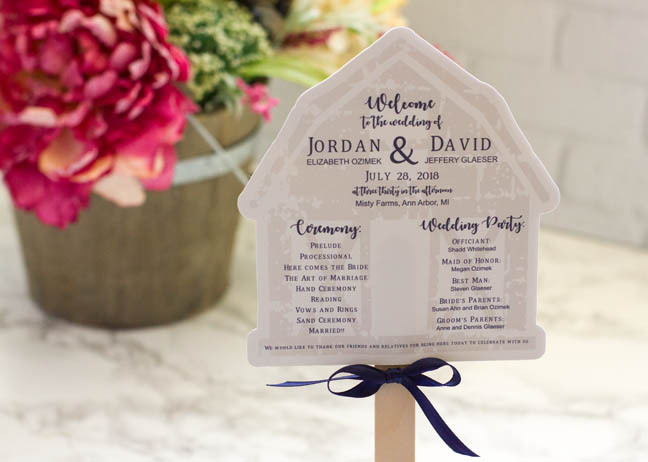 Use your hot glue gun to attach the popsicle stick to one side of the barn papers, then attach the other side and around all of the edges of the paper too. 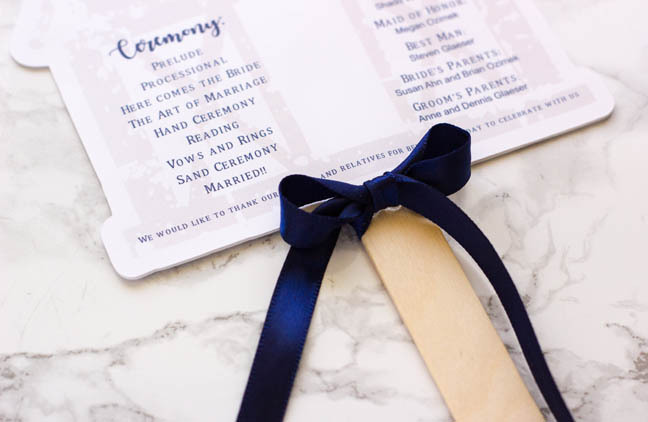 The final step to finishing off the whole look is to tie a small bow with ribbon at the top of the popsicle stick. Repeat this process as many times as needed for the wedding! 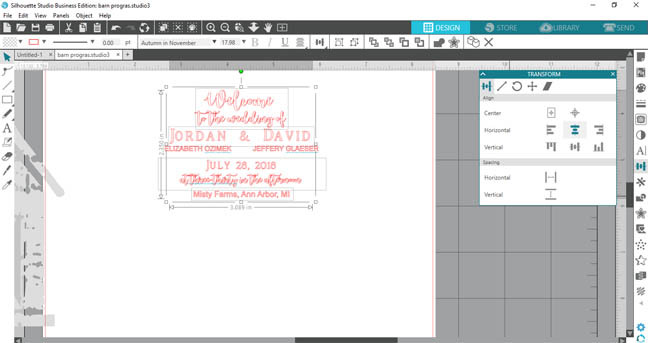 I'm actually going to send my files to be printed at a local office supply store so I'm not using tons of computer ink. Then I'll bring them home and cut them out with my machine. Needless to say, my week will be busy!! I hope this helped inspire you for your wedding coming up! 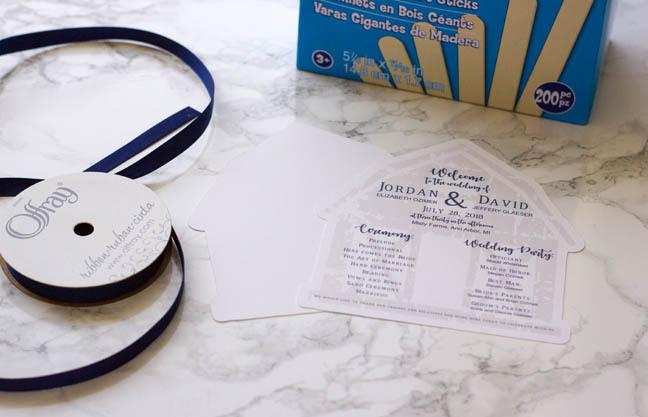 I personally LOVE designing all the wedding craft details. 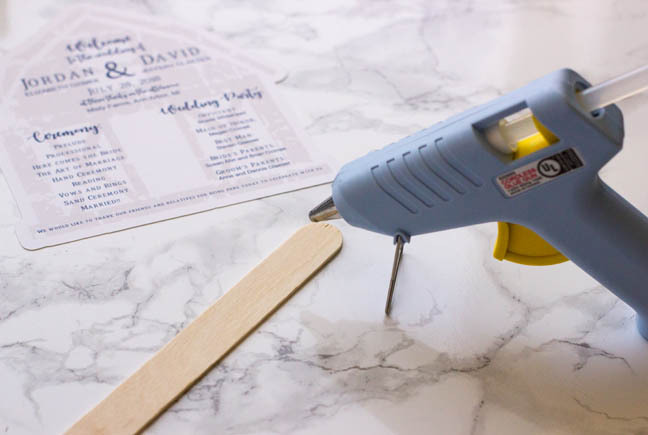 I'm so sad that I didn't know about these wonder craft tools while planning my own wedding. I guess I'll just have to keep helping others with theirs instead.